Star jasmine (Trachelospermum jasminoides, aka Trach jas or Trachies in the plural) is almost universally regarded as the best jasmine to grow in Sydney, and fills gardens with its wonderful fragrance during its main flowering period from October to December. It has dark green, glossy and attractive leathery leaves, and the new growth that precedes and follows the small white fragrant flowers is lime green, giving the plant a stunning two-tone effect at that time of the year. Unlike some other jasmines, one of the major benefits of this plant is that it flowers during the warmer months when you are likely to be working or entertaining outside, and can thus appreciate the perfume, which is particularly strong at night. Although it grows reasonably fast, Star Jasmine doesn't become straggly or invasive like so many other creepers, and is virtually pest and disease free. 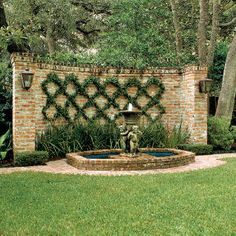 A light pruning from time to time will give a neat clipped effect for a formal garden if desired, but left to its own devices Trach jas will meander its way up an old piece of lattice, or complement an informal corner as a tallish ground cover or rather large spillover plant. It also makes an excellent standard plant whether grown in pot or ground, provided the round head is regularly pruned to shape. Star Jasmine is sometimes unfairly accused of being allergenic. Unlike Jas. polyanthum which is a known allergen to Asthma & Hayfever sufferers, Star Jasmine was on the Asthma Foundation’s list of non-allergenic plants last time I looked! Star Jasmine can flower in full glory from mid spring till Christmas, as well as spot flowering throughout the year. 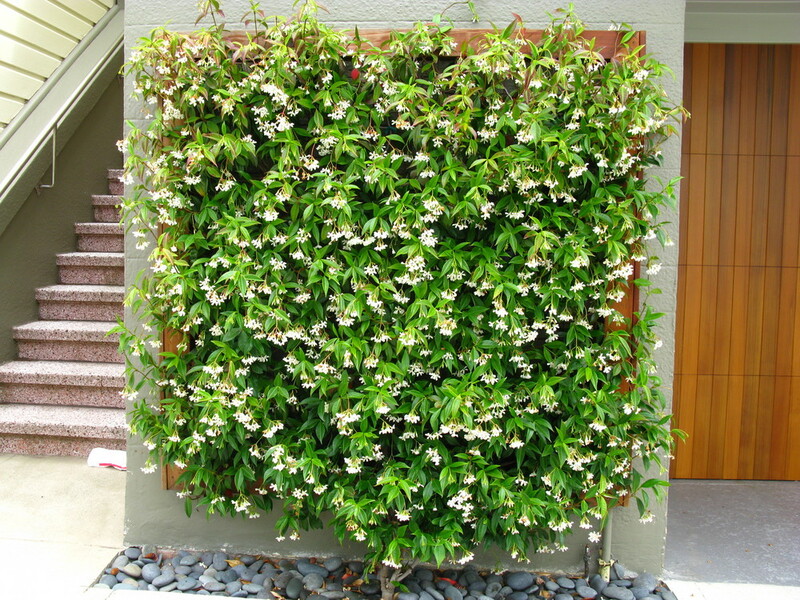 Preferring light shade, part sun or full sun, Star jasmine is seen to best effect as a screening plant. Grown along the top of a fence or lattice, it will quite quickly obliterate the neighbour’s view into your garden, as well as provide them a much nicer look than the old timber fence or their bathroom! 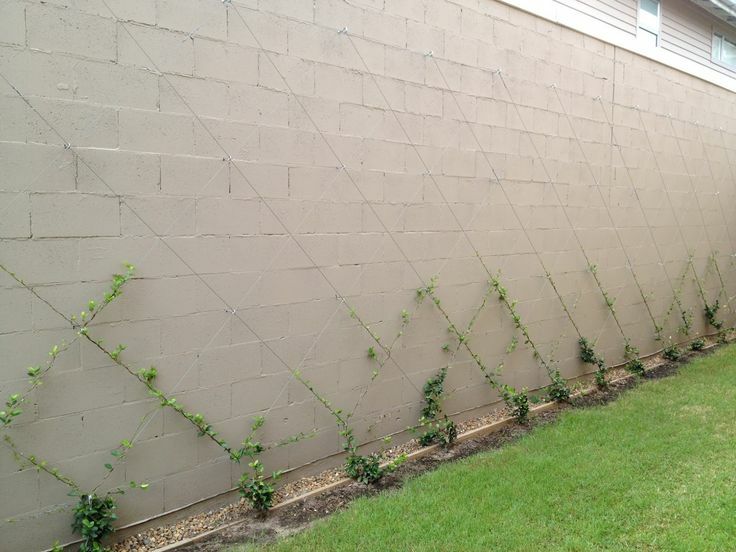 It is also easy to grow on a brick wall, with a favoured method being to install eye-hook dyna bolts, use a strong galvanised wire and add a “strainer” to tighten the wire as the jasmine puts on weight. This is quick and inexpensive, and the wires will be covered quite quickly, but some people prefer to us stainless steel wire and grow Trach jas in a criss cross fashion on a feature wall, as per the photos below. That can look stunning, but the wires should be at least 40cm apart and some maintenance will be required to stop the jasmine spreading from one wire to another and spoiling the effect. Again adjustable wire strainers are critical to achieve this aesthetic effect. When grown in pots, Star jasmine requires nothing more than a good quality potting mix (Pot Power is the best by far) and regular fertilising with Organic Life, Osmocote, Nitrosol or Harvest. Remember that when potted jasmine has clung to lattice it is going to be very difficult to repot, so it is wise to choose the largest pot possible and the longest lasting mix to allow for future growth. Trach. Jas, suffers from very few pest & diseases if grown well. Occasional aphid outbreaks are easily fixed with almost any garden insecticide (or soapy water), and in the rare circumstance of mite attack, more frequent spraying with Bug Guard or Neem Oil may be required. Star Jasmine has a few relatives, including at least two variegated varieties, but its favoured cousin is the fantastic prostrate T. asiaticum. This variety doesn’t flower nearly as well as Trach jas, but is great as a low growing groundcover, with new growth that has both lime green and burnished autumn tones, making for a stunning look set against the dark green mature leaves. T. asiaticum is seen to best effect as either a groundcover, or spilling over a wall or pot. It is just as if not more hardy than the more common star jasmine, and is a personal favourite of mine. Also exquisite is the much slower growing Trach jas 'Tricolour', showing variegated leaves in green & white, with new growth a delicious pink colour.